With their high mass and low compliance, mc’s also required high-mass tonearms, which meant they didn’t work particularly well with most arms because those arms catered to mm’s. (Today the situation is of course reversed: The only current arms I’m aware of that are optimized for mm’s are the SME Model M-9-1 [an updated 3009 II] and the Mørch arms with their optional low-mass tubes.) As if all this were not off-putting enough, mc’s were more expensive than mm’s—a gap that has widened almost unimaginably this last decade—and involved additional expenses because of the step-up transformers and head-amps required to boost their low signal-outputs. 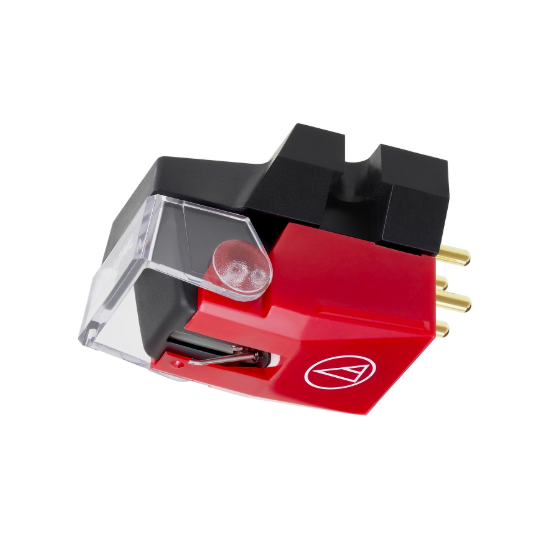 Another not-so-hidden cost involved stylus replacement: mm’s have user-replaceable stylus assemblies that typically cost a fraction of the pickup itself, while mc’s need to be “re-tipped,” a euphemism for the requirement that you must buy a whole new cartridge (typically at a “reduced” rate of 50–75 percent—e.g., a $4000 mc will set you back $1500–$3000 come stylus-replacement time). Given this set of chains, how did moving coils become ascendant, then dominant? Well, for one thing, some of them got better: flatter in frequency response, thus more neutral in tonal balance—though a lot more work is required to make them so—and if their tracking forces didn’t get all that much lower, then at least the tracking itself got considerably better. (The first that really hooked me was David Fletcher’s Talisman Boron, marketed by Sumiko [circa early Eighties], which was nearly ruler flat and at 2.5 grams tracked like crazy, well able to negotiate those ludicrous cannon blasts on the vinyl release of the Telarc 1812 Overture.) These days you can find mc’s to accommodate any number of musical tastes. For another, electronics got better, so the noise levels we had to put up with got lower or effectively vanished at all but extremely high playback levels. For a third, we became more sophisticated about how to use mc’s, paramountly in eschewing the insanity, propagated by TAS’s own founder, the late Harry Pearson, of running them wide open instead of damping the high-frequency resonances with proper impedance loading (the only way an mc has any hope of having a flat frequency response). The mention of Harry Pearson brings us to the fourth reason, which I honestly believe cannot be minimized, at least so far as the American audiophile scene goes: namely, the appearance of The Absolute Sound. In the very early issues Harry favored moving magnets, in particular the ADC XLM, which could track at 0.75 grams in an SME 3009 arm (though the notoriously unreliable cantilevers would collapse if you looked at them the wrong way). But soon enough he became enamored of moving coils because he prioritized soundstaging (especially depth), transparency, detail, and “airiness” over tonal neutrality and timbral accuracy as such. Of course some of what Harry liked owed precisely to the mc limitations and defects I’ve already noted, their presence dips exaggerating depth and their undamped high-frequency resonances making for a rising top end that falsely accentuated detail and often gave the impression of an equally bogus “airiness” (it is my personal belief that those undamped resonances can also result in a subjective impression of faster transient response and increased dynamic range, two additional HP priorities). For these reasons and more, even some of Harry’s stable of reviewers questioned the folly of running mc’s unloaded. (“Would you drive a car without shocks?” I heard Dave Wilson ask on more than one occasion.) Regardless, whatever else can be said of Harry’s accomplishments in the history of audio journalism, for better or for worse he almost singlehandedly shifted the paradigm of the way audio reproduction in the home is evaluated, and mc’s were a crucial part of the dialogue. These thoughts and this review are prompted by a reader’s question several issues ago as to why we don’t review more moving-magnet pickups. So when Robert Harley asked me if I’d like to review some, I jumped at the opportunity. I should begin by saying that while the three pickups under consideration here are not expensive, and at least two of them are what many, perhaps most audiophiles and reviewers would relegate to the sub-economy category, I am nevertheless evaluating them by the same standards I would use if they were substantially more expensive. While I realize there is nothing to be done about the perfectly human tendency to believe that something that costs more money than something else must also be better, when it comes to mm’s versus mc’s, the better part of discretion calls for judgmental prudence: mc’s are intrinsically more expensive to make than mm’s. This is simply a fact of mc technology, but in and of itself not a fact that allows for any presumptions as to their superiority to less costly technologies. Nonetheless, once mc’s took over, audio reviewers, blissfully ignoring the engineers like Sax, Alexander, Ricker, et. al. who actually make their living mastering many of the recordings we use as references, soon consigned mm’s to the bargain bins, suitable for budget and entry-level systems but not something that any “real” audiophile would use in a “serious” system. I must further add that if you’re the kind of person for whom price always determines quality, you can probably stop reading now because it’s actually very difficult to find a really expensive moving-magnet pickup—expensive, that is, in the inflated terms of high-end audio—which I believe is more market driven than anything else. Why would a manufacturer want to go all out on a moving magnet that he could sell for a grand or two at most when there is a market full of consumers perfectly willing to spend several thousands for a moving coil? Yet, thankfully, a few do, the two manufacturers under consideration here being exhibits A and B. Audio-Technica, which has been manufacturing pickups since 1962, offers a range of mm and mc cartridges priced from $50 to $5000. Grado, a family-owned firm that has been in the phono pickup business since 1953, and manufactures moving irons from $75 to a staggering $12,000. All three pickups were mounted in a Basis Vector IV tonearm on a Basis 2200 turntable feeding the moving-magnet phonostage of my McIntosh C52 preamplifier. The two mm’s were terminated with capacitance values recommended by the manufacturer (something the C52 allows with ease); I used the HiFi News and Record Review Test Record to ensure that arm/pickup resonances fell within the desired 8–12Hz range; all were tracked at the manufacturers’ recommended forces (if a range is specified, I went for the higher weight on the principle of better a half a gram too heavy than a quarter gram too light). As the Basis setup is far more expensive than would normally be used with pickups in this price range, I also checked them out on a $1999 Acoustic Signature Primus integrated turntable (see sidebar). In view of the pricing of these three pickups I shouldn’t complain about the lack of tapped threaded holes in the cartridge bodies, but I sure wish they had them. It’s so long since I’ve had a pickup without them that I’d all but forgotten how time-consuming those infernal nuts and slotted (as opposed to Allen) screws make the installation and alignment process.